A scoop of cooling, fresh mint granita takes the sweet/tart flavors of watermelon and raspberries to new heights. A fresh and frosty treat that’s simple yet sophisticated; granitas are the grown-up version of childhood snow cones. Each icy mouthful is pure bliss on a sweltering day. 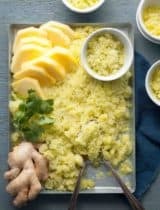 At its simplest, it can serve as a refreshing palate cleanser between courses; it adds an elegant touch to any meal and never fails to impress. Dressed up a bit it also makes an excellent dessert or afternoon treat on a hot summer day. Best of all, unlike its smoother cousin, sorbet, it offers the ability to be made without an ice cream machine. 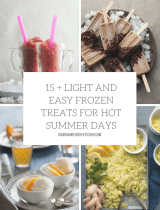 Just whizz everything in the blender, then freeze and scrape every so often until you have a mound of flakey ice crystals. 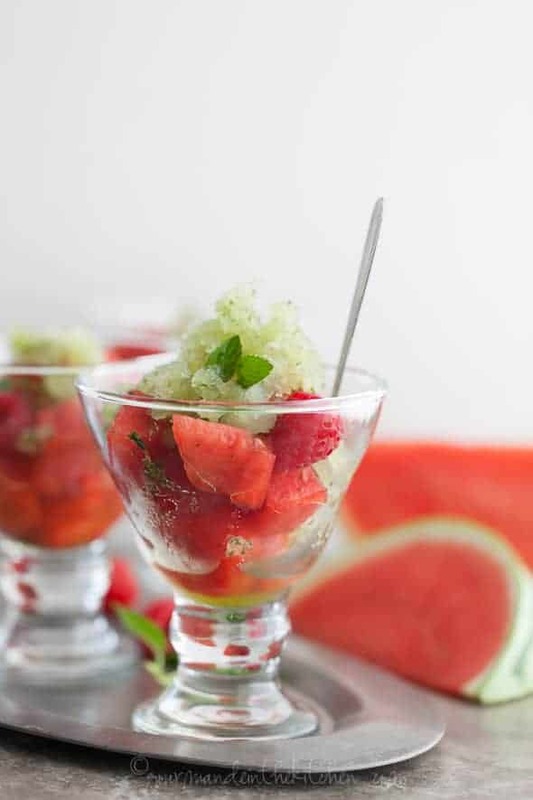 Wonderfully fresh and vibrant, this mint granita is served on top of cubes of juicy watermelon and tart raspberries dressed with a squeeze of zippy lime juice. Its cooling properties really hits the spot when you’re craving something light and refreshing. The granita’s pure minty sweet taste is extra bold thanks to the inclusion of the whole leaves. 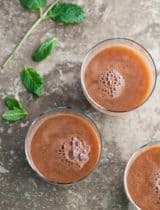 Rather than using an infusion as the base, I blend up the fresh mint leaves with the rest of the ingredients leaving little green flecks throughout the finished granita which impart a crisper and cleaner flavor. Top it with a few extra sprigs of mint for a pretty garnish and serve in pre-chilled glasses to keep everything icy cold even longer. How do you cool off when the weather’s hot? P.S. 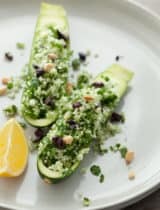 I’ve collected 16 of my favorite fast and fresh recipes for the latest Foodie Recipes App Edition. 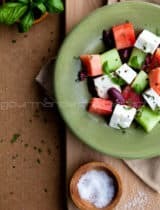 The app features quick and easy recipes for summer like fresh salads and fruit based desserts. Download it for free and check out the Gourmande in the Kitchen Fast and Fresh Edition! A fresh and frosty treat that’s simple yet sophisticated. Skim any foam off the top and pour the blended mixture into a shallow freezer safe pan and place it in the freezer. Remove the pan from the freezer after about an hour and stir to break up the ice crystals. Return to the freezer and repeat every 30 minutes to an hour, until the mixture has turned into even icy flakes and is easy to scoop. 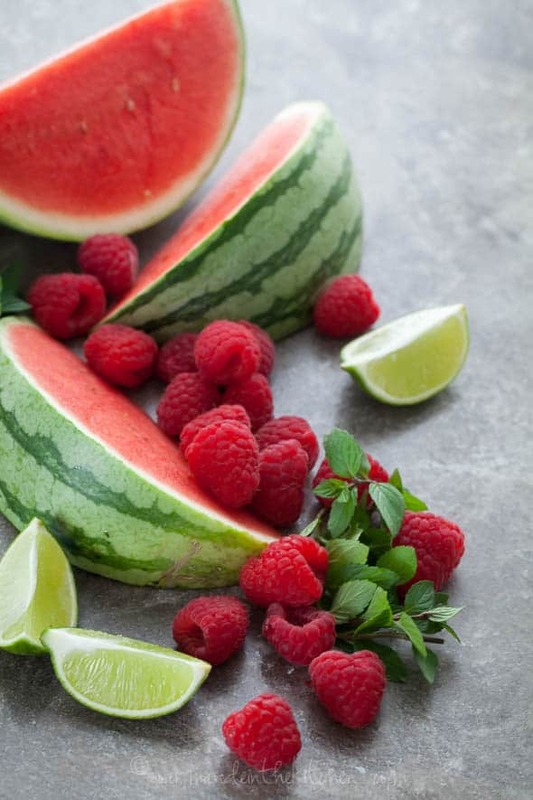 To serve, squeeze the juice of a lime and scatter it's zest over the cut watermelon chunks and divide evenly into glass serving dishes along with the fresh raspberries. 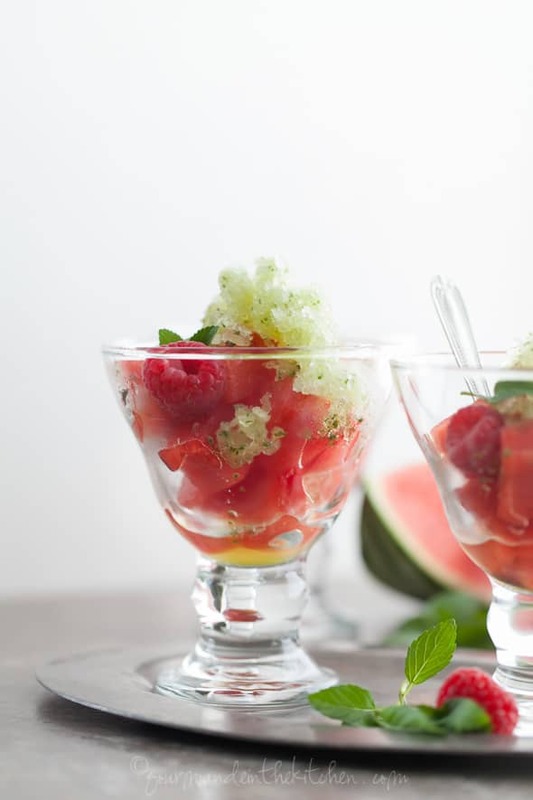 Scoop the granita into the fruit filled glasses and garnish with extra mint leaves. Serve immediately. I love eating pinky fruity desserty type things during summer, makes me feel more feminine. How do we cool off? We shamelessly use the kiddy pool! Embarrassing but true!! 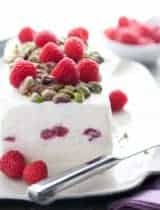 This looks like the perfect refreshing summer time dessert Sylvie! This looks so refreshing. Love, love, love! How refreshing and delicious this looks! Perfect for hot summer evening. Sounds delicious! Have you tried blending the fruits in with the water? What a great idea! I have to admit, this sounds like the only thing I'd want to eat when the temperature hits 90F. :) Mint and watermelon for the win! Absolutely perfect for the summer, loving how light this is and how easy it is to make. You totally inspired me to make my own with those pictures! It's been soooo hot here for the last week or so, I would love one of these right now! what an awesome idea + flavour combo! seriously can never go wrong with a granita.. its the perfect summer treat. love it! So incredible! Love the combination with the fresh berries! Your photos are stunning. 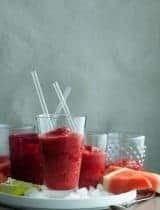 And this granita sounds divine!! What a gorgeous, refreshing treat! 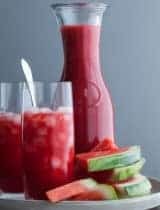 You know, I have a "Wacky for Watermelon" pinterest board and this recipe with its beautiful photos would look perfect there. Love it! This is incredibly gorgeous and looks so refreshing.